The Pentagon Federal Credit Union Foundation held its annual Night of Heroes Gala on Thursday, June 3, 2010 at the Ritz-Carlton, Washington, DC. This year, the Night of Heroes honored the Intelligence and Special Operations communities. James Fortune has been the honorary photographer for the event and generously donates previous photographs of famous individuals for auction. In addition to corporate, political and military guests were wounded patients from Walter Reed Army Medical Center and Bethesda National Naval Medical Center and residents from the Armed Forces Retirement Home. 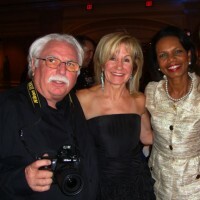 The keynote speech was given by The Honorable Condoleezza Rice, 66th U.S. Secretary of State. The awards were presented by General Barry McCaffrey USA (Ret). James had the rare opportunity to get in front of the camera for a quick picture with the former Secretary of State, Condoleezza Rice. It was a fabulous night for all who attended!